When you watch sports, you want an easy-drinking, non-filling, light beer. That way you can have quite a few while still saving room for delicious nachos, chips and salsa, buffalo wings, and bratwurst. Ohhhhh yeaahhhhhh... Makes my mouth water just thinking about that stuff. But for most people, this means standard, macrobrewed American lagers. Which is a shame. There are light beers out there that are similar, yet so much better. Enter Kentucky Light, a Kölsch-style Ale from the Lexington Brewery. (I have already reviewed the other two beers in their line-up, Kentucky Ale and Kentucky Bourbon-Barrel Ale, both of which are unique and quite tasty.) Kölsch Ale is style of beer from Germany that is technically an ale, but is cold-conditioned like a lager. This gives it properties of both ales and lagers. 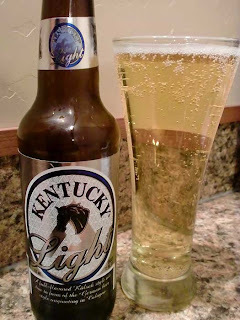 Kentucky Light is a good example of the style, which in fact won a bronze medal at the Great American Beer Fest. Kentucky Light pours a very light, crystal-clear straw color with a fairly thin head. It smells of very subtle dry pale malts. You take a sip and are greeted with crisp, refreshing mild barley notes, a lot like a Pilsner, with a bit of citrus and rather mild hops in the finish. For me, it has a lot of the same notes as standard Coors, but more refreshing and more flavorful, if that makes any sense. This is a beer that people could enjoy and drink a lot of, without being too filling or heavy, perfect for watching sports and having snacks. Drink This: if you want a crisp, refreshing, light beer that won't fill you up, but is still well above the taste and quality of American Macrobrews. Don't Drink This: if you want a heavy, brooding, complex sipping beer. This beer is not that kind of drink. BUT, it is really quite good for the style of beer it is. Turn on the sports, get out your munchies, and enjoy! Cheers!